CAT6 Crossover Cables are available for connecting two pieces of equipment. 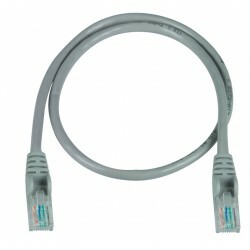 Use these cables to connect two systems (computer to computer, switch to switch, or hub to hub) directly together for two-way communication. Category 6 UTP cable wired straight through. 24 AWG 8x8 RJ45 plugs. Patch cables & boots are gray; boots are snagless.